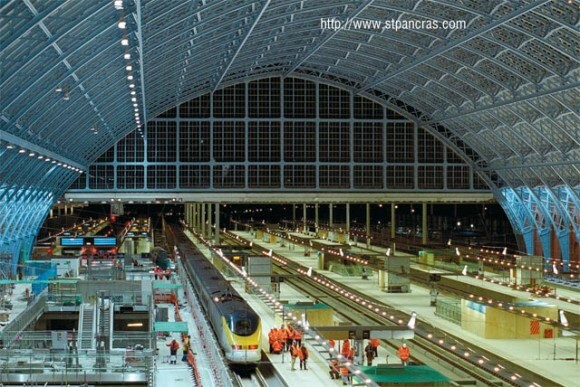 Renovation of St.Pancras train station, in central London, to suit requirements of the Eurostar train that will commence its route next month. The virgin voyage of the Eurostar train along the new and improved High Speed 1 railroad set a new record for train journeys as the journey London to Paris was completed in two hours and three minutes. The new route that connects London to Paris will be available to the public next month and the cost of the ticket will be proportional to that of average airline fares. The average time for the route has been estimated at two hours and fifteen minutes, hence twenty minutes less than any previous journey. The Eurostar train moves at 300 kilometers per hour and improvement in the existing structure of the railroad allows for trains to maintain this speed en route and upon their return from Paris. Eurostar departs from St. Pancras train station in central London, not Waterloo station from where it originally departed. The cost of the new high-speed railroad and the renovation of St. Pancras station to meet the route requirements was some 8.5 billion euros.